Gosh I love Spring. Temps in the 70s, everything in bloom and green. The promise of new life, new gardening. 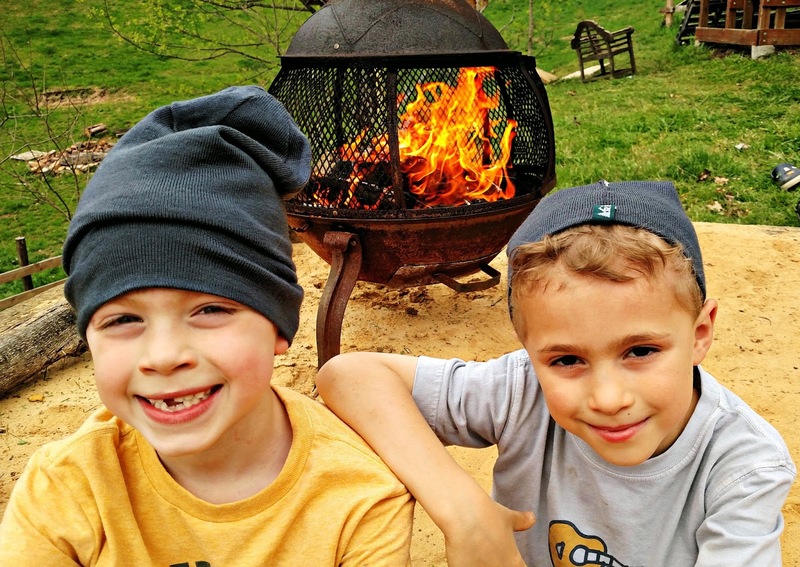 Here's a picture of the twins on Easter, waiting to make s'mores out of Peeps. After the suggestion of one of my blog readers (who are always teaching me wonderful things, and giving me new ideas), I canned the butternut squash I had left from last fall, before it could start to go bad. When canning squash, you have to cube it, and you must use a pressure canner. It was a lot of work to peel and cube so much butternut in one go, but now all I have to do is open a jar! I plan to use it a lot in soups or rice bowls. You can see my garden corral in the background of this picture. Another sign of spring? All the butterflies and bees. On a recent run, I discovered this rather unusual moth. I don't carry a camera or phone when I run on our trails, so I went back and found it later. I loved it's creamy yellow coloring and brown stripe. 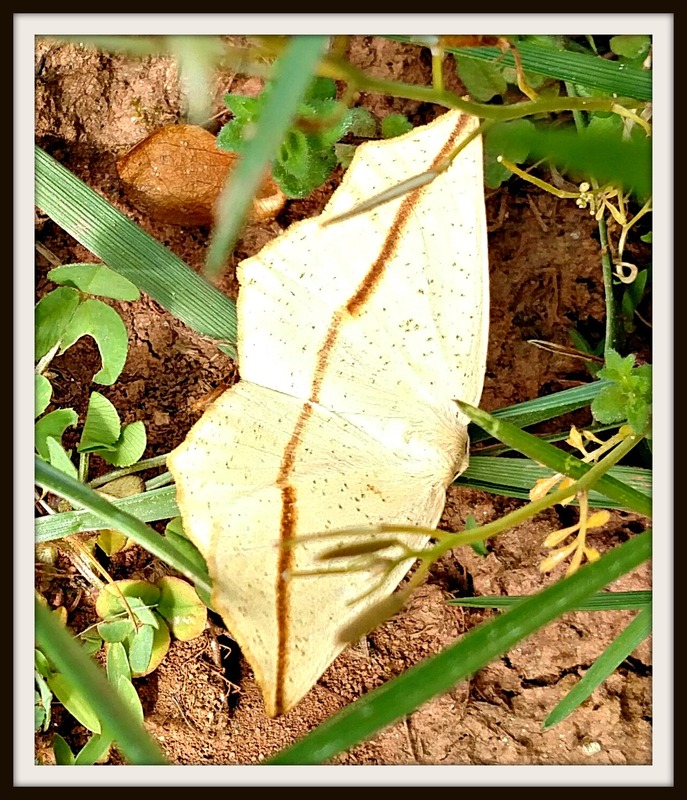 According to google, this seems to be a swallowtail moth. Readers, what are the small things delighting you this spring? ...I used to can butternut, it's a lot work! I have never canned butternut squash, but I know it will be convenient for you in the long run! Never had Peep s'mores either. Today is my first day of summer break, so let the gardening, flower raising, interesting stuff begin! Your boys are so adorable! Those jars of butternut squash are very pretty with the light shining through them. We have bird feeders and a squirrel feeder and an extra bird bath up this year, and we have enjoyed watching the wildlife. Of course, the kitties love their Bird TV. :-) We have a few things planted in the raised bed, and we enjoy seeing the new plants coming up. And everything is so green with all the rain we've been having. I am not a fan of hot weather, but 60s and 70s are pretty nice. It hasn't been spring here for a LONG time. It's 10 AM and 80 degrees. Probably will hit 90 today. Yeah... I like the "winter" months most while living in Florida--especially February and November. Look at those precious faces! Look at all that squash! Girl, you really stay busy; I really admire both you and Paul. I've probably said that a few times before. As for here, it's hot; no rain in about six weeks but thankfully no fires close by as they are other places in Florida. unrelated... always carry a phone on you when you run! I have a small fanny pack that works great and fits snug so it doesn't bounce around. You never know when an idiot might pull up to you to ask for directions and instead is doing something else. (yup, happened). Also, you could suddenly twist an ankle really bad, you could come across a bear or mountain lion on trails... you could be clipped by a car on the road, Why take the chance of not having a way to communicate. Just do it. These are truly gorgeous pictures. I have never seen a butterfly like this. And it surprises me that it was still there when you returned. This is a lot of squash, and it looks so pretty all lined up. But the big surprise for me is Cort. Oh my, how he has changed! He looks so much more mature and grown up!! But it looks like he still has those beautiful blonde curls. The garden will be covered in green again soon. Mine is but it is all weeds so I need to work on it again before I can till and plant. I haven't seen a moth like that, maybe it is an alien life form, hey they could look just like moths. Remember moth man? ive never thought of canning butternut! how interesting. and ive only been gone from here for a few short months to get my bearings with our little new one and your boys have just sprouted!! Seeing the green leaves of trees, plant and flowers and how kids react to it all! Oh My---so many wonderful things are capturing my fancy now... I just LOVE spring ---and all of its beauty... Our Roses are beginning to bloom like crazy ---so we are out taking pictures every day just to see a new bloom... Oh how wonderful that is!!!!! AND--our Lilies are trying to bloom and the Day Lilies are budding.... YEAH RAH... Thank God for Spring. What a delightful post! 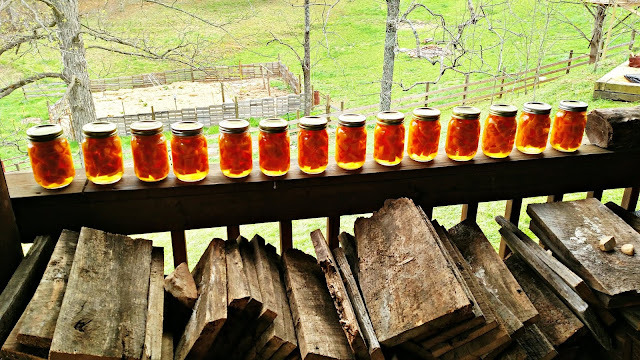 I've stopped canning. I'm having trouble growing my veggies!!! Tose guys of yours are really growing up! Great to see them, and hear what's up. I'm working on retaining walls, and on some new security features up here on the mountain. That's about all of my spring doings. I've just been amazed at how much color is around us. The flowers, the green lawns, and even the sky seem to "pop." Everything is so bright and vibrant. I'm also thankful for long days and the ability to take walks with my son after school/work. I really did miss this time of year! Happy spring, my friend! I'm a fan of Spring too. I've never personally canned food but love to eat the fruits and vegetables that come out of it. A friend recently gave me canned beets and canned pickles. Delish! We have some butternut squash left over from last autumn and I was wondering what to do with it....so I shall have a go at canning it! I also have some cherries to do! Those boys are so cute! Yep it's the small things!